I love using my pressure cooker for making delicious meals in a matter of minutes. Nothing takes longer than 20 minutes to cook, not counting the preparation time, of course. Beef Stew, Beef Goulash, Ribs, Italian sausage and kraut, are just few of the recipes I make only in the pressure cooker, and LOVE the convenience of preparing these meals. Cut ribs into serving pieces. Season the meat with salt, pepper, and paprika. Heat Cooker and add shortening. Brown ribs on both sides. Add onions, and saute until golden. Remove all contents from the Cooker and set aside. Place the basket inside the Cooker, and fill up with the meat and onions. Combine catchup, vinegar, Worcestershire Sauce, chili powder, celery seed, and water. Pour over meat in Cooker. Close cover securely and lock it in place. Cook for 15 minutes, with pressure escaping through the vent, evenly. Once all the pressure is released and the steam stops coming out of the vent, unlock the handle, uncover the cooker, and your spareribs dinner is ready to serve. This recipe is quick, easy, and delicious. I received a pressure cooker at my bridal shower, but this is the first thing I’ve ever made in it. 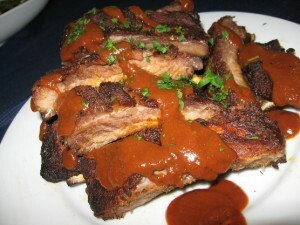 The ribs are so tender that you don’t need a knife to eat them. The sauce is tangy, yummy, and plentiful. I love that this recipe is quick enough to make from scratch on a WEEKnight! Great idea for including a pressure cooker on your bridal registry. I am also glad to hear that a busy mom, like yourself, still is able to treat her family to a quick, but delicious meal on a weeknight.